A few souls brought together as it were by chance, for a short friendship and mutual dependence in this little ship of earth, so soon to land her passengers and break up the company for ever." - C. KINSGLEY. To thine own self be true, And it must follow, as the night the day, Thou canst not then be false to any man." - SHAKSPEARE, Polonius to Laertes. "If you would escape vexation, reprove yourself liberally and others sparingly."-CONFUCIUS. IT was the third year of our Oxford life, and Milligan and I were now the "senior men" resident in college ; we sat at one of the higher tables in hall, and occupied stalls in chapel. We generally attended lectures together, and many are the amusing tricks I recall which Milligan used to play-one especially, on a freshman named Dry - a pious youth in green spectacles, and with the general aspect of "Verdant Green." An undergraduate's gown is always adorned with two long strings behind ; these strings of Dry, Milligan adroitly fastened to mine, and, inventing one excuse after another, for slipping round the room to open the door, shut a window, &c., he eventually had connected the whole lecture in one continuous chain; finally, he fastened himself to Dry on the other side; and then, with loud outcries of "Don't, Dry, - don't, Dry," pulled himself away, the result being that Dry and his chair were overturned, and that the whole lecture, one after another, came crashing on the top of him! Milligan would have got into a serious scrape on this occasion, but that he was equally popular with the tutors and his companions, so that every possible excuse was made for him, while I laughed in such convulsions at the absurdity of the scene, that I was eventually expelled from the lecture, and served as a scapegoat. Meantime, I had discovered the depth of my iniquity, and fled to the rooms of Duckworth, a scholar, to whom I recounted my adventure, and with whom I stayed. Late in the evening a note was brought in for Duckworth, who said, "It is a note from John Conington," and read - "Dear Duckworth, having been the victim of a cruel outrage on the part of some undergraduates of the college, I trust to your friendship for me to assist me in finding out the perpetrators," &c. Duckworth urged that I should give myself up - that John Conington was very good-natured - in fact, that I had better confess the whole truth, &c. So I immediately sat down and wrote the whole story to Professor Conington, and not till I had sent it, and it was safe in his hands, did Duckworth confess that the note he had received was a forgery, that he had contrived to slip out of the room and write it to himself-and that I had made my confession unnecessarily. However, he went off with the story and its latest additions to the Professor, and no more was said. If Milligan was my constant companion in college, George Sheffield and I were inseparable out of doors, though I often wondered at his caring so much to be with me, as he was a capital rider, shot, oarsman - in fact, everything which I was not. I believe we exactly at this time, and for some years after, supplied each other's vacancies. It was the most wholesome, best kind of devotion, and, if we needed any ennobling influence, we always had it at hand in Mrs. Eliot Warburton, who sympathised in all we did, and who, except his mother, was the only woman whom I ever knew George Sheffield have any regard for. It was about this time that the Bill was before Parliament for destroying the privileges of Founder's kin. While it was in progress, we discovered that George was distinctly "Founder's kin" to Thomas Teesdale, the founder of Pembroke, and half because our ideas were conservative, half because we delighted in an adventure of any kind, we determined to take advantage of the privilege. Dr. Jeune, afterwards Bishop of Peterborough, was Master of Pembroke then, and was perfectly furious at our audacity, which was generally laughed at at the time, and treated as the mere whim of two foolish schoolboys; but we would not be daunted, and went on our own way. Day after day I studied with George the subjects of his examination, goading him on. Day after day I walked down with him to the place of examination, doing my best to screw up his courage to meet the inquisitors. We went against the Heads of Houses with the enthusiasm of martyrs in a much greater cause, and we were victorious. George Sheffield was forcibly elected to a Founder's-kin Scholarship at Pembroke, and was the last so elected. Dr. Jeune was grievously annoyed, but, with the generosity which was always characteristic of him, he at once accorded us his friendship, and remained my most warm and honoured friend till his death about ten years afterwards. He was remarkable at Oxford for dogmatically repealing the law which obliged undergraduates to receive the Sacrament on certain days in the year. "In future," he announced in chapel, "no member of this college will be compelled to eat and drink his own damnation." In urging George Sheffield to become a scholar of Pembroke, I was certainly disinterested ; without him University lost half its charms, and Oxford was never the same to me without "Giorgione" - the George of Georges. But our last summer together was uncloudedly happy. We used to engage a little pony-carriage at the Maidenhead, with a pony called Tommy, which was certainly the most wonderful beast for bearing fatigue, and as soon as ever the college gates were opened, we were "over the hills and far away." Sometimes we would arrive in time for breakfast at Thame, a quaint old town quite on the Oxfordshire boundary, where John Hampden was at school. Then we would mount the Chiltern Hills with our pony, and when we reached the top, look down upon the great Buckinghamshire plains, with their rich woods; and when we saw the different gentlemen's places scattered about in the distance, we used to say, "There we will go to luncheon" - "There we will go to dinner," and the little programmes we made we always carried out; for having each a good many relations and friends, we seldom found we had no link with any of the places we came to. Sometimes Albert Rutson would ride by the side of our carriage, but I do not think that either then or afterwards we quite liked having anybody with us, we were so perfectly contented with each other, and had always so much to say to each other. Our most delightful day of all was that on which we had luncheon at Great Hampden with Mr. and Lady Vere Cameron and their daughters, who were slightly known to my mother; and dined at the wonderful old house of Chequers, filled with relics of the Cromwells, the owner, Lady Frankland Russell, being a cousin of Lady Sheffield's. Most enchanting was the late return from these long excursions through the lanes hung with honeysuckle and clematis, satiated as we were, but not wearied with happiness, and full of interest and enthusiasm in each other and in our mutual lives, both past and present. One of the results of our frequent visits to the scenes of John Hampden's life was a lecture which I was induced to deliver in the town-hall at Oxford, during the last year of my Oxford life, upon John Hampden - a lecture which was sadly too short, because at that time I had no experience to guide me as to how long such things would take. It was during this spring that my mother was greatly distressed by the long-deferred declaration of Mary Stanley that she had become a Roman Catholic.1 A burst of family indignation followed, during which I constituted myself Mary's defender, utterly refused to make any difference with her, as well as preventing my mother from doing so ; and many were the battles I fought for her. A little episode in my life at this time was the publication of my first book - a very small one, "Epitaphs for Country Churchyards." It was published by John Henry Parker, who was exceedingly good-natured in undertaking it, for it is needless to say it was not remunerative to either of us. The ever-kind Landor praised the preface very much, and delighted my mother by his grandiloquent announcement that it was "quite worthy of Addison!" And which was by Liddell?" Dr. Liddell, when it was shown up, only said, "I think you are rather severe." As to education, I did not receive much more at Oxford this year than I had done before. The college lectures were the merest rubbish; and of what was learnt to pass the University examinations, nothing has since been of use to me, except the History for the final Schools. About fourteen years of life and above �4000 I consider to have been wasted on my education of nothingness. At Oxford, however, I was not idle, and the History, French, and Italian, which I taught myself, have always been useful. "Oxford, Feb. 19, 1856. - Your news about dear Mary (Stanley) is very sad. She will find out too late the mistake she has made: that, because she cannot agree with everything in the Church of England, she should think it necessary to join another, where, if she receives anything, she will be obliged to receive everything. I am sorry that the person chosen to argue with her was not pne whose views were more consistent with her own than Dr. Vaughan's. It is seldom acknowledged, but I believe that, by their tolerance, Mr. Liddell and Mr. Bennett2 keep as many people from Rome as other people drive there. I am very sorry for Aunt Kitty, and hope that no one who loves her will add to her sorrow by estranging themselves from Mary - above all, that you will not consider her religion a barrier. When people see how nobly all her life is given to good, and how she has even made this great step, at sacrifice to herself because she believes that good may better be carried out in another Church, they may pity her delusion, but no person of right feeling can possibly be angry with her. And, after all, she has not changed her religion. It is, as your own beloved John Wesley said, on hearing that his nephew had become a Papist  'He has changed his opinions and mode of worship, but has not changed his religion: that is quite another thing.'" "Lime, March 30, 1856. - My mother and I have had a very happy Easter together - more than blessed when I look back at the anxiety of last Easter. Once when her bell rang in the night, I started up and rushed out into the passage in an agony of alarm, for every unusual sound at home has terrified me since her illness; but it was nothing. I have been full of my work, chiefly Aristotle's Politics, for 'Greats' - too full, I fear, to enter as I ought into all her little thoughts and plans as usual: but she is ever loving and gentle, and had interest and sympathy even when I was preoccupied. She thinks that knowledge may teach humility even in a spiritual sense. She says, 'In knowledge the feeling is the same which one has in ascending mountains - that, the higher one gets, the farther one is from heaven.' To-day, as we were walking amongst the flowers, she said, 'I suppose every one's impressions of heaven are according to the feeling they have for earthly things: I always feel that a garden is my impression - the garden of Paradise.' 'People generally love themselves first, their friends next, and God last,' she said one day. 'Well, I do not think that is the case with me,' I replied; 'I really believe I do put you first and self next.' 'Yes, I really think you do,' she said." 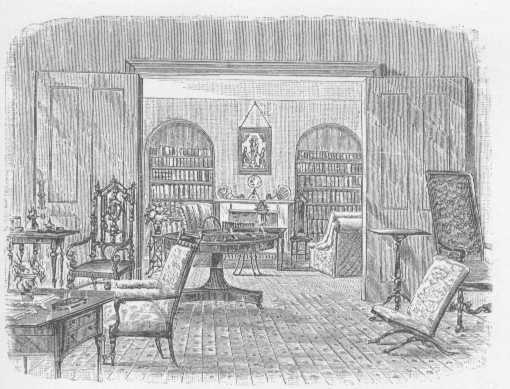 When I returned to Oxford after Easter, 1856, my pleasant time in college rooms was over, and I moved to lodgings over Wheeler's bookshop and facing Dr. Cradock's house, so that I was able to see more than ever of Mrs. Eliot Warburton. I was Jmost immediately in the "Schools," for the classical and divinity part of my final examination, which I got through very comfortably. While in the Schools at this time, I remember a man being asked what John the Baptist was beheaded for - and the answer, "Dancing with Herodias's daughter!" Once through these Schools, I was free for some time, and charades were our chief amusement, Mrs. Warburton, the Misses Elliot,3 Sheffield, and I being the principal actors. The proclamation of peace after the Crimean War was celebrated - Oxford fashion - by tremendous riots in the town, and smashing of windows in all directions. At Whitsuntide, I had a little tour in Warwickshire with Albert Rutson as my companion. We enjoyed a stay at Edgehill, at the charming little inn called "The Sun Rising," which overlooks the battlefield, having the great sycamore by its side under which Charles I. breakfasted before the battle, and a number of Cavalier arms inside, with the hangings of the bed in which Lord Lindsey died. From Edgehill I saw the wonderful old house of the Comptons at Compton-Whinyates, with its endless secret staircases and trap-doors, and its rooms of unplaned oak, evidently arranged with no other purpose than defence or escape. We went on to Stratford-on-Avon, with Shakspeare's tomb, his house in Henley Street, and the pretty old thatched cottage where he wooed his wife - Anne Hathaway. Also we went to visit Mrs. Lucy (sister of Mrs. William Stanley) at Charlecote, a most entertaining person, with the family characteristic of fun and good-humour; and to Combe Abbey, full of relics of Elizabeth of Bohemia and her daughters, who lived there with Lord Craven. Many of the portraits were painted by her daughter Louisa. A few weeks later I went up to the Stanleys in London for the Peace illuminations - "very neat, but all alike," as I heard a voice in the crowd say. I saw them from the house of Lady Mildred Hope, who had a party for them like the one in Scripture, not the rich and great, but the "poor, maimed, halt, and blind;" as, except Aldersons and Stanleys, she arranged that there should not be a single person "in society" there. "Lime, June 8, 1856. - I had found the dear mother in a sadly fragile state, so infirm and tottering that it is not safe to leave her alone for a minute, and she is so well aware of it, that she does not wish to be left. She cannot now even cross the room alone, and never thinks of moving anywhere without a stick. Every breath, even of the summer wind, she feels most intensely. '"The Lord establish, strengthen you," that must be my verse,' she says." "June 15. - I am afraid I cannot help being tired of the mental solitude at home, as the dear mother, without being ill enough to create any anxiety, has not been well enough to take any interest, or have any share in my doings. Sometimes I am almost sick with the silence, and, as I can never go far enough from her to allow of my leaving the garden, I know not only every cabbage, but every leaf upon every cabbage." "June 29. - We have been for a week with the Stanleys at Canterbury, and it was very pleasant to be with Arthur, who was his most charming self." Early in July, I preceded my mother northwards, made a little sketching tour in Lincolnshire, where arriving with little luggage, and drawing hard all day, I excited great commiseration amongst the people as a poor travelling artist. "Eh, I shouldn't like to have such hard work as that on. Measter, I zay, I should'na like to be you." At Lincoln I joined my mother, and we went on together to Yorkshire, where my friend Rutson lent us a charming old manor-house, Nunnington Hall near Helmsley, the centre of an interesting country, in which we visited the principal ruined abbeys of Yorkshire. My mother entirely recovered here, and was full of enjoyment. On our way to Harrogate, a Quakeress with whom we travelled persecuted me with "The Enquiring Parishioner on the Way to Salvation," and then, after looking at my sketches, hoped that "one so gifted was not being led away by Dr. Pusey!" At Bolton we stayed several days at the Farfield Farm, and thence drove through Swale Dale to Richmond. On our way farther north, I paid my first visit to my cousins at Ravensworth, and very alarming I thought it; rejoining my mother at Warkworth, a place I have always delighted in, and where Mrs. Clutterbuck4 and her daughters were very kind to us. More charming still were the next few days spent with my kind old cousin Henry Liddell (brother-in-law of my Aunt Ravensworth) in Bamborough Castle. "Tillycouttry House, August 12, 1856. - My mother will be surprised that, instead of writing from an inn, I should date from one of the most beautiful places in the Ochils, and that I should be staying with people whom, though we met for the first time a few hours ago, I already seem to know intimately. "When I left my mother and entered the train at Stirling, two ladies got in after me; one old, yellow, and withered; the other, though elderly, still handsome, and with a very sweet interesting expression. She immediately began to talk. 'Was I a sportsman?' - 'No, only a tourist.' - 'Then did I know that on the old bridge we were passing, the Bishop of Glasgow long ago was hung in full canonicals?' And with such histories the younger of the two sisters, in a very sweet Scottish accent, animated the whole way to Alloa. Having arrived there, she said, 'If we part now, we shall probably never meet again: there is no time for discussion, but be assured that my husband, Mr. Dalzell, will be glad to see you. Change your ticket at once, and come home with me to Tillycoultry.' And . . . I obeyed; and here I am in a great, old, half-desolate house, by the side of a torrent and a ruined churchyard, under a rocky part of the Ochils. "Mr. Dalzell met us in the avenue. He is a rigid maintainer of the Free Kirk, upon which Mrs. Huggan (the old sister) says he spends all his money - about � 18,ooo a year - and he is very odd, and passes three-fourths of the day quite alone, in meditation and prayer. He has much sweetness of manner in speaking, but seems quite hazy about things of earth, and entirely rapt in prophecies and thoughts either of the second coming of Christ or of the trials of the Kirk part of his Church on earth. "Mrs. Dalzell is quite different, truly, beautifully, practically holy. She 'feels,' as I heard her say to her sister to-night, 'all things are wrapt up in Christ.' The evening was very long, as we dined at four, but was varied by music and Scotch songs. "The old Catholic priest who once lived here cursed the place, in consequence of which it is believed that there are - no little birds!" "Dunfermilne, August 13. - This morning I walked with Mr. Dalzell to Castle Campbell - an old ruined tower, on a precipitous rock in a lovely situation surrounded by mountains, the lower parts of which are clothed with birch woods. Inside the castle is a ruined court, where John Knox administered his first Sacrament. On the way we passed the little burial-ground of the Taits, surrounded by a high wall, only open on one side, towards the river Devon." "Falkland, August 14. -After drawing in beautiful ruined Dunfermline, I drove to Kinross, and embarked in the 'Abbot' for the castle of Loch Leven, which rises on its dark island against a most delicate distance of low mountains. . . . There is a charming old-fashioned inn here, and a beautiful old castle, in one of the rooms of which the young Duke of Rothesay was starved to death by his uncle." "St Andrews, August 15. - This is a glorious place, a rocky promontory washed by the sea on both sides, crowned by Cardinal Beaton's castle, and backed by a perfect crowd of ecclesiastical ruins. The cathedral was the finest in Scotland, but destroyed in one day by a mob instigated by John Knox, who ought to have been flayed for it. Close by its ruins is a grand old tower, built by St. Regulus, who 'came with two ships' from Patras, and died in one of the natural caves in the cliff under the castle. In the castle itself is Cardinal Beaton's dungeon, where a Lord Airlie was imprisoned, and whence he was rescued by his sister, who dressed him up in her clothes." "Brechin, August 17. - The ruin of Arbroath (Aberbrothock) is most interesting. William the Lion is buried before the high altar, and in the chapter-house is the lid of his coffin in Scottish marble, with his headless figure, the only existing effigy of a Scottish king. In the chapter-house a man puts into your hand what looks like a lump of decayed ebony, and you are told it is the 'blood, gums, and intestines' of the king. You also see the skull of the Queen, the thigh-bone of her brother, and other such relics of royalty. Most beautiful are the cliffs of Arbroath, a scene of Scott's 'Antiquary.' From a natural terrace you look down into deep tiny gulfs of blue water in the rich red sandstone rock, with every variety of tiny islet, dark cave, and perpendicular pillar; and, far in the distance, is the Inchcape Rock, where the Danish pirate stole the warning bell and was afterwards lost himself; which gave rise to the ballad of 'Sir Patrick Spens.' The Pictish tower here is most curious, but its character injured by the cathedral being built too near." I have an ever-vivid recollection of a most piteous Sunday spent in the wretched town of Brechin, with nothing whatever to do, as in those days it would have made my mother too miserable if I had travelled at all on a Sunday - the wretched folly of Sabbatarianism (against which our Saviour so especially preached when on earth) being then rife in our family, to such a degree, that I regard with loathing the recollection of every seventh day of my life until I was about eight-and-twenty.5 After leaving Brechin, I saw the noble castle of Dunottar, and joined my mother at Braemar, where we stayed at the inn, and Charlotte Leycester at a tiny lodging in a cottage thatched with peat. I disliked Braemar extremely, and never could see the beauty of that much-admired valley, with its featureless hills, half-dry river, and the ugly castellated house of Balmoral. Dean Alford and his family were at Braemar, and their being run away with in a carriage, our coming up to them, our servant John stopping their horses, the wife and daughters being taken into our carriage, and my walking back with the Dean, first led to my becoming intimate with him. I remember, during this walk, the description he gave me of the "Apostles' Club" at Cambridge, of which Henry Hallam was the nucleus and centre, and of which Tennyson was a member, but from which he was turned out because he was too lazy to write the necessary essay. Hallam, who died at twenty-two, had "grasped the whole of literature before he was nineteen." The Alfords were travelling without any luggage, and could consequently walk their journeys anywhere - that is, each lady had only a very small hand-bag, and the Dean had a walking-stick, which unscrewed and displayed the materials of a dressing-case, a pocket inkstand, and a candlestick.On our way southwards I first saw Glamis. I did not care about the places on the inland Scottish lakes, except Killin, where our cousin Fanny Tatton and her friend Miss Heygarth joined us, and where we spent some pleasant week-days and a most abominable Sunday. We afterwards lingered at Arrochar on Loch Long, whither Aunt Kitty and Arthur Stanley came to us from Inverary. We returned to Glasgow by the Gareloch, which allowed me to visit at Paisley the tomb of my royal ancestress, Marjory Bruce. At Glasgow, though we were most uncomfortable in a noisy and very expensive hotel, my mother insisted upon spending a wretched day, because of - Sunday! We afterwards paid pleasant visits at Foxhow and Toft, whence I went on alone to Peatswood in Shropshire (Mr. Twemlow's), and paid from thence a most affecting visit to our old home at Stoke, and to Goldstone Farm, the home of my dear Nurse Lea. 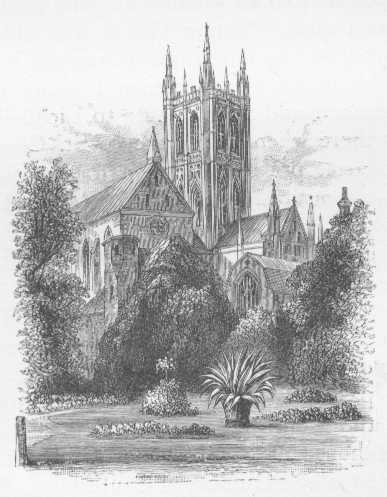 Hence I returned with Archdeacon and Mrs. Moore to Lichfield, and being there when the grave of St. Chad was opened, was presented with a fragment of his body - a treasure inestimable to Roman Catholics, which I possess still. During the remaining weeks of autumn, before I returned to Oxford, we had many visitors at Lime, including my new friend Mrs. Dalzell, whose goodness and simplicity perfectly charmed my mother. We passed the latter part of the winter between the Penrhyns' house at Sheen, Aunt Kitty's house of 6 Grosvenor Crescent, and Arthur Stanley's Canonry at Canterbury. With Arthur I dined at the house of Mr. Woodhall, a Canterbury clergyman, now a Roman Catholic priest, having been specially invited to meet (at a huge horseshoe table) "the middle classes" - a very large party of chemists, nurserymen, &c., .and their wives, and very pleasant people they were. I used to think Canterbury perfectly enchanting, and Arthur was most kind and charming to me. While there, I remember his examining a school at St. Stephen's, and asking the meaning of bearing false witness against one's neighbour - "When nobody does nothing to nobody," answered a child, "and somebody goes and tells." FROM THE DEAN'S GARDEN, CANTERBURY. "the cleverest woman of his acquaintance," though her exterior - with a short waist, brown mantle of stamped velvet, and huge bonnet, full of full-blown red roses - was certainly not captivating. Sydney Smith always called her "Grota," and said she was the origin of the word grotesque. Mrs. Grote was celebrated for having never felt shy. She had a passion for discordant colours, and had her petticoats always arranged to display her feet and ankles, of which she was excessively proud. At her own home of Burnham she would drive out with a man's hat and a coachman's cloak of many capes. She had an invalid friend in that neighbourhood, who had been very seriously ill, and was still intensely weak. When Mrs. Grote proposed coming to take her for a drive, she was pleased, but was horrified when she saw Mrs. Grote arrive in a very high dogcart, herself driving it. With great pain and labour she climbed up beside Mrs. Grote, and they set off For some time she was too exhausted to speak, then she said something almost in a whisper. "Good God! don't speak so loud," said Mrs. Grote, "or you'll frighten the horse: if he runs away, God only knows when he'll stop." On the . occasion of this visit at Oxford, Mrs. Grote sat with one leg over the other, both high in the air, and talked for two hours, turning with equal facility to Saffi on Italian Literature, Max M�ller on Epic Poetry, and Arthur on Ecclesiastical History, and then plunged into a discourse on the best manure for turnips and the best way of forcing Cotswold mutton, with an interlude first upon the "harmony of shadow" in watercolour drawing, and then upon rat-hunts at Jemmy Shawe's - a low public-house in Westminster. Upon all these subjects she was equally vigorous, and gave all her decisions with the manner and tone of one laying down the laws of Athens. She admired Arthur excessively, but was a capital friend for him, because she was not afraid of laughing - as all his own family were - at his morbid passion for impossible analogies. In his second lecture Arthur made a capital allusion to Mn Grote, while his eyes were fixed upon the spouse of the historian, and when she heard it, she thumped with both fists upon her knees, and exclaimed loudly, "Good God! how good!" I did not often meet Mrs. Grote in after life, but when I did, was always on very cordial terms with her. She was, to the last, one of the most original women in England, shrewd, generous, and excessively vain. I remember hearing that when she published her Life of her husband, Mr. Murray was obliged to insist upon her suppressing one sentence, indescribably comic to those who were familiar with her uncouth aspect. It was - "When George Grote and I were young, we were equally distinguished by the beauty of our persons and the vivacity of our conversation!" Her own true vocation she always declared was that of an opera-dancer.Arthur Stanley made his home with me during this visit to Oxford, but one day I dined with him at Oriel, where we had "Herodotus pudding" - a dish peculiar to that college. "Lime, Easter Sunday, April 12, 1857. - I have been spending a happy fortnight at home. The burst of spring has been beautiful - such a golden carpet of primroses on the bank, interspersed with tufts of still more golden daffodils, hazels putting forth their fresh green, and birds singing. My sweet mother is more than usually patient under the trial of failure of sight - glad to be read to for hours, but contented to be left alone, only saying sometimes - 'Now, darling, come and talk to me a little.' On going to church this morning, we found that poor Margaret Coleman, the carpenter's wife, had, as always on this day, covered Uncle Julius's grave with flowers. He is wonderfully missed by the people, though they seldom saw him except in church; for, as Mrs. Jasper Harmer said to me the other day, 'We didn't often see him, but then we knew he was always studying us - now wasn't he?'" A subject of intense interest after my return to . Oxford was hearing Thackeray deliver his lectures on the Georges. That which spoke of the blindness of George III., with his glorious intonation, was indescribably pathetic. It was a great delight to have George Sheffield back and to resume our excursions, one of which was to see the May Cross of Charlton-on-Ottmoor, on which I published a very feeble story in a magazine; and another to Abingdon, where we had luncheon with the Head-master of the Grammar School, who, as soon as it was over, apologised for leaving us because he had got "to wallop so many boys." All our visits to Abingdon ended in visits to the extraordinary old brothers Smith, cobblers, who always sat cross-legged on a counter, and always lived upon raw meat. We had heard of their possession of an extraordinary old house which no one had entered, and we used to try to persuade them to take us there; but when we asked one he said, "I would, but my brother Tom is so eccentric, it would be as much as my life is worth - I really couldn't;" and when we asked the other he said, "I would, but you've no idea what an extraordinary man my brother John is; he would never consent." However, one day we captured both the old men together and over-persuaded them (no one ever could resist George), and we went to the old house, a dismal tumble-down building, with shuttered windows, outside the town. Inside it was a place of past ages - old chairs and cupboards of the sixteenth century, old tapestries, and old china, but all deep, deep in dust and dirt, which was never cleaned away. It was like the palace of the Sleeping Beauty after the hundred years' sleep. I have several pieces of china out of that old house now - "Gris de Flandres ware." In June I made a little tour, partly of visits, and from Mrs. Vaughan's house at Leicester had an enchanting expedition to Bradgate, the ruined home of Lady Jane Grey, in a glen full of oaks and beeches of immense age. In my final (History and Law) Schools I had passed with great ease, and had for some time been residing at Oxford as a Bachelor, having taken my degree. But as one friend after another departed, the interest of Oxford had faded. I left it on the 13th of June 1857, and without regret. 1 The declaration had already been made in private to Lady Stratford de Redcliffe at Constantinople. 2 Rectors of St. Paul's, Knightsbridge, and St. Barnabas', Pimlico. 3 Daughters of the Dean of Bristol. 4 Daughter of my great-great-uncle T. Lyon of Hetton. 5 How little those who idolise him in theory attend to the precept of their beloved Luther : "If anywhere Sunday is made holy for the mere day's sake, - if any one anywhere sets up its observance as a Jewish foundation, then I order you to work on it, to dance on it, to do anything that shall remove this encroachment on Christian liberty." - Table-Talk. 6 Count Aurelio Saffi died 1890, and is buried at Forli.